Pittsburgh-based construction law firm Dingess, Foster, Luciana, Davidson and Chleboski (DFL Legal) and three of its named partners have been recognized by U.S. News and World Report as among the report's "Best Law Firms" and "Best Lawyers" of 2014. 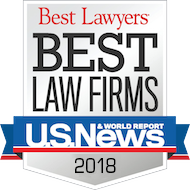 DFL Legal's recognition as a 2014 "Best Law Firm," includes both a National Ranking and a Pittsburgh Metropolitan Area Ranking for Construction Law and Construction Litigation. In addition, John Dingess, Joseph Luciana and Brian Davidson were all designated as "Best Lawyers" in the categories of Construction Law and Commercial Litigation. Mr. Dingess was also designated a best lawyer for "bet-the-company" litigation.